The summer holidays are the one time of year when it is acceptable to stuff your face with cheap food and drink, and stuff your brain with cheap paperback novels. As with the food, you tend to have a good time during the consumption of the books but regret it later on. 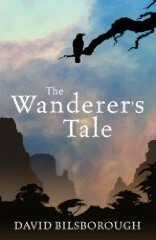 So it is with A Wanderer's Tale by David Bilsborough, the book I foolishly bought to read during a recent trip. A Wanderer's Tale is a typical fantasy romp in which a mismatched group of adventures from diverse backgrounds are assembled to complete a quest, the object of which lies at the end of an epic journey through dangerous lands. Along the way, the group encounters terrible creatures and unexpected friends, while internal differences threaten to ... blah, blah, blah, etc, etc. We have all read this story before, the plot of A Wanderer's Tale rates about 800 Milli-Shannaras on the Terry Brooks Lord of the Rings Ripoff Scale. So they continued doggedly, pacing out the most painful steps upon that darkest stretch of their road so far. The Peladane's mood was black and leaden, and emanated from him like a cloud of necrotizing spores to the others of the company, infecting them with its bane. Few words were uttered, the name of Methuselech mentioned not once, and only Whitehorse - lightened of his burden but darkened of heart - dared glance back toward those evil heights wherein still lay his master. Looks like my list of signs you are living in a fantasy novel needs to be updated. The text is littered with this type of literary land-mine - bad analogies, puns, and ill-advised humor explode into the reader's face every couple of pages. These tended to stay with me, rotting my brain (perhaps like the bane generated by cloud of necrotizing spores) long after the details of the plot have faded. The one good thing about A Wanderer's Tale is the setting, the world our adventurers are bumbling around in is quite nicely set up with suitably weird non-human races living in fantastic hidden valleys. It would make a very nice campaign setting for a role-playing game, a more cynical reviewer might suggest that the author ran a D&D game for a few months and wrote a novel out of the notes he made along the way. One last nitpick: I bought A Wanderer's Tale because from the cover it looked like a stand alone novel but it turns out it is actually the first of a series. This means that you don't even get the satisfaction of an ending. Not really recommended, even by the standards of cheap fantasy paperbacks you can do much better.